It's that time again. Over 140 children with diabetes and siblings are counting on us again to provide a week of fun, physical education, and lessons in dealing with diabetes. Whether you are a newcomer or a veteran volunteer, they hope that your participation will provide them with a memorable summer. 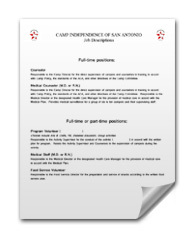 Camp Independence will be held July 22nd through July 26th at St. Mary's Hall School. Complete the online form in its entirety. Review the job descriptions below. Be sure to note which days you will participate and note if you will be absent for part of the day. Please submit $5.00 with the online contract to offset the cost of snacks and Camp T-shirt by July 14, 2019. New (Dryfit) staff shirts will be available for $20.00 at staff orientation. Staff training is being planned. Please hold the date Saturday, July 20th, 9 AM to noon to meet your colleagues and to orient to changes in camp and to make Monday morning as smooth as possible. Deadline for staff signup is July 14, 2019. If you need additional applications for colleagues, friends, etc. please call me at 830-981-8297 or send me an e-mail at mdanney@gvtc.com. Check out our website at www.ci-sa.org. I look forward to helping you have a productive year at Camp Independence 2019. Our first camp planning session will be held Wednesday, April 11, 2018 at the Diabetes and Glandular Disease Clinic, 5107 Medical Drive, at 6:00 PM. 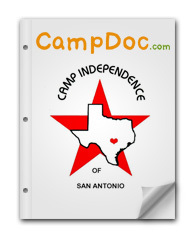 All volunteers are invited to attend to help design the T-shirt, to help outline the schedule, to help identify possible sources of donations, and provide additional input to the planning of Camp Independence of San Antonio 2019. The Board of Directors looks forward to your participation. 2004 Camp Independence, Inc. All rights reserved.